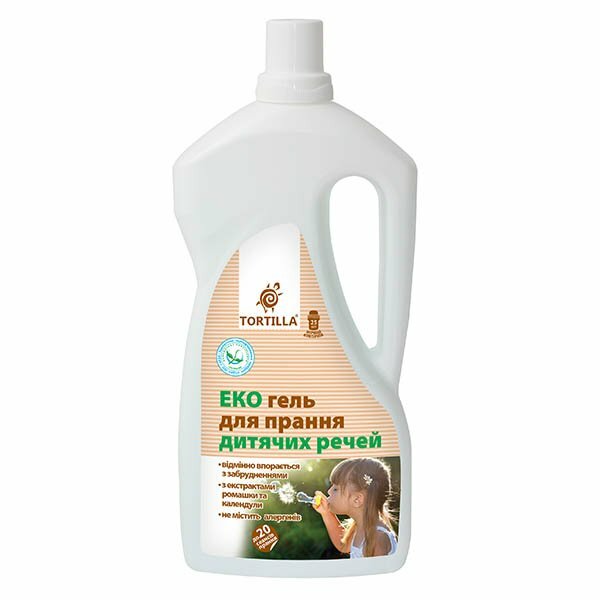 Household care brand Tortilla (Ukraine) presents ECO Baby Laundry Detergent. This is a completely safe and hypoallergenic product designed to take care of delicate baby clothes. Free of colourants, allergens, phosphates, chlorine, aggressive surfactants, and other potentially dangerous ingredients. Tortilla Baby Laundry Detergent can be used to wash different types of fabric, including cotton, linen, synthetic and mixed fibres. It is suitable for both whites and colours. The product removes all kinds of stains and doesn’t leave any residue. It can be used in all types of washing machines, as well as for hand wash. The detergent is based on mild surfactants and infused with chamomile extract and calendula (marigold) extract. These extracts are valued for their anti-inflammatory and soothing effect on the skin. The product contains only safe ingredients that pose no harm to human health or the environment. It is safe for people prone to allergic reactions or those who has overly sensitive skin. Directions. Machine wash: 50–75 ml detergent per 4–5 kg dry laundry. Hand wash: 25–50 ml detergent for 3 l water. 1 cap = 25 ml. Use more detergent for persistent stains or heavily soiled laundry. Ingredients. Water; 5–15%: Anionic Surfactants; < 5%: Soap, Amphoteric Surfactants, Non-ionic Surfactants, Chamomilla Recutita Extract, Calendula Officinalis Extract, Opacifier, Complexing Agent, Parfum, Optical Brightener, Preservative, Sodium Chloride, Anti-Foaming Agent. Want to buy ECO Baby Laundry Detergent? Call us or submit your order via our web site! TORTILLA is a popular household care brand owned and produced by Sirena, a Ukrainian company that manufactures safe and eco-friendly household products. Sirena owns 8 brands and produces over 100 detergents, cleaners, and other products designed for keeping your house clean. Since its founding in 1997, the company has become one of Ukraine’s leading manufacturers of high-quality and affordable household chemicals. TORTILLA offers a wide range of products for different purposes. They include liquid and powder laundry detergents for whites, colours and baby clothes, fabric softeners, fabric stain removers, cleaners for various kinds of surfaces, drain cleaners, dish soaps, toilet cleaners, water softeners, dishwasher detergents, scale removers, and more. All these products are formulated with biodegradable detergents. Sirena produces household chemicals that are safe for human health and the environment. All TORTILLA products are approved by the Ministry of Health of Ukraine and ISO 14204 compliant, which is confirmed by the Green Crane ecolabel on the packaging. With TORTILLA, you can be sure that you keep your house clean without harming the environment.